Watching Addams Family Values for the umteenth time the other day, I was reminded of the infamous Stanford Prison Experiment. This was an often-referenced psychological study conducted at Stanford University in 1971 that went terribly wrong. Selected from 75 candidates, 25 healthy, middle-class male students were divided into two groups: the prisoners and the prison guards. What was to be a two-week experiment had to be called off after only six days. The guards had become, seemingly overnight, sadistic, vindictive bullies, abusing the prisoners. The prisoners, who were dressed in prison uniforms, and given numbers for names, were punished by the guards for the slightest infraction. The prisoners began to withdraw, several became so emotionally traumatized that they had to be removed from the experiment, and the increasingly sinister environment led by the power-mad guards entirely. The Stanford Prison Experiment is described in the book I’m reading now called “Everyday Survival: Why Smart People Do Stupid Things” by Laurence Gonzales. The book is a completely chilling exploration of the trance-like, unquestioning state that most of us go through our everyday existence. One of the biggest cognitive pitfalls for many of us is the idea of “groupness. ” As the people we surround ourselves with act and behave, so do we act and behave. This pack mentality makes us forget to question our actions, the world around us. In this state of groupness, we can become be guilty of some pretty awful decisions and behaviour. 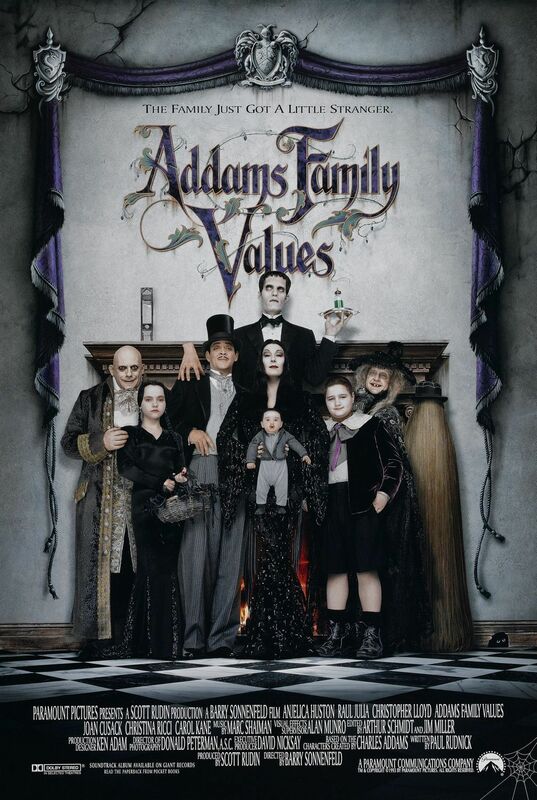 Addams Family Values deals, rather entertainingly, with the idea of groupness. There’s the complex folks who make up the Addams Family, each of whom delights in the dark, damp world of the graveyard and other things that go bump in the night. Also they wear black and enjoy murder. Then there’s the normals, most portrayed by polo-shirt-wearing, peroxide blondes with capped teeth and plastic surgery noses. Of particular note here is the henchgirl of all of the fluffy, waspy normals played by the wonderful Vancouver-born actress Mercedes McNab. McNab also plays one of my favourite characters, Harmony, on the Buffy the Vampire Slayer and Angel television series. She’s seemingly born to play a blonde mean girl with more than just a whiff of instability. On the other side is Wednesday Addams played by Christina Ricci (Sleepy Hollow). Wednesday is a bit of an icon in our household. Her flat, dispassionate stare, uniformly black wardrobe and caustic wit are things to admire. Another thing to admire is her questioning mind, as evidenced in the scene with her new baby brother Pubert: “Pugsley, the baby weighs ten pounds, the cannonball weighs twenty pounds. Which will hit the stone walkway first?” Jimmy Workman as blunt-force, blank Pugsley is a fitting foil to Wednesday’s murderous, inquisitive ways. Apparently, questioning the world around us, and the norms of our group are all things that might help our long-term survival as a species, according to author Laurence Gonzales. I agree. The amazing ensemble cast including the divine Anjelica Huston (The Grifters) as Morticia Addams, Raul Julia as the only Gomez I will ever love, Christopher Lloyd (Back to the Future) as Uncle Fester and the incredible Joan Cusack (Hoodwinked Too) as the gold-digging, serial-killing Debbie Jellinsky. I love them, love them, love them all. And when Wednesday and Pugsley get sent to a privileged summer camp, the groupness kicks in with a vengeance. The camp outcasts rise up against the cruel, money-grubbing normals. It makes my outcast, questioning heart sing every time.